Dr BR Ambedkar was right in saying that capitalism and brahmanism are the two evils the workers of the country had to deal with. By the passage of time, it has been converted to neo-liberalism and Hindutva. As education became a constitutionally guaranteed right, the Hindutva brigade had to become friends with the neo-liberalism to stop the students from marginalised communities to enter. It introduced private universities, gave nod for foreign universities, submitted to the wishes of powerful educational lobbies that enabled autonomous institutions and institutions of eminence. The case of Jio Institute further escalates the seriousness of the issue. The Hindutva brigades want to take the students of marginalised communities to make a retreat to their caste occupation and want to get awed by the diversity of this great nation. Its good to rely on the past and to regain strength, but when the past is blurred with oppression for centuries for a particular section of society due to the writings in shastras, it does not qualify to be a matter of pride. The government had introduced affirmative actions in the field of education to make students of marginalised communities accessible to educational facilities. But the administration that is dipped in the water of brahminism would not allow these students to either enter or create blockades to stop them in the way. Some people cede to their interests helplessly, while some others resist till the last. When neo-liberalism took its shape, it made money as the basic necessity to attain education that hindered many of the marginalised students to the classrooms. Arrival of foreign universities too blocked the marginalised students entry as it favoured students who are more connected to the producers of knowledge. At this backdrop is the deferment of BA courses at Tata Institute of Social Sciences, Hyderabad became a decision to worry for those who are critical of the future of public education in the country. Telangana would again become a state without a single course being offered in social sciences, according to sociologist Kalpana Kannabiran. The same institution witnessed huge protests this February due to the non-payment of scholarships to students from SC, ST and OBC (NC) categories. The reasons put up by the administration against the closure of course was also akin to the lame comments that a corporate company would raise for firing an employee for no good reason. The reason being lack of infrastructural facilities and paucity of funds. The question that remains unanswered is the fact that the institution had also confirmed that the contract for the current campus would end by March 2019. It is obvious to raise a counter argument that if the campus is shifted to a new place would it be deprived of infrastructural facilities or is it a cover up to end a course that has created some of the best minds of the country. Red-faced by constant sexual harassment cases due to insecure surroundings, the institution had decided to take a backseat from next year regarding hostel administration. But it has maintained that the new arrangement would reduce the hostel and dining charges as the rates are decided by the market. But shrugging responsibility and disregarding accountability at the cost of an hypothetical rent reduction is also a manifestation of neoliberal attack. This apart, separate hostels for students from marginalised communities from next year would create the much-needed social ostracisation that the Hindutva brigade wants to happen and the TISS administration is adding fuel to this agenda. 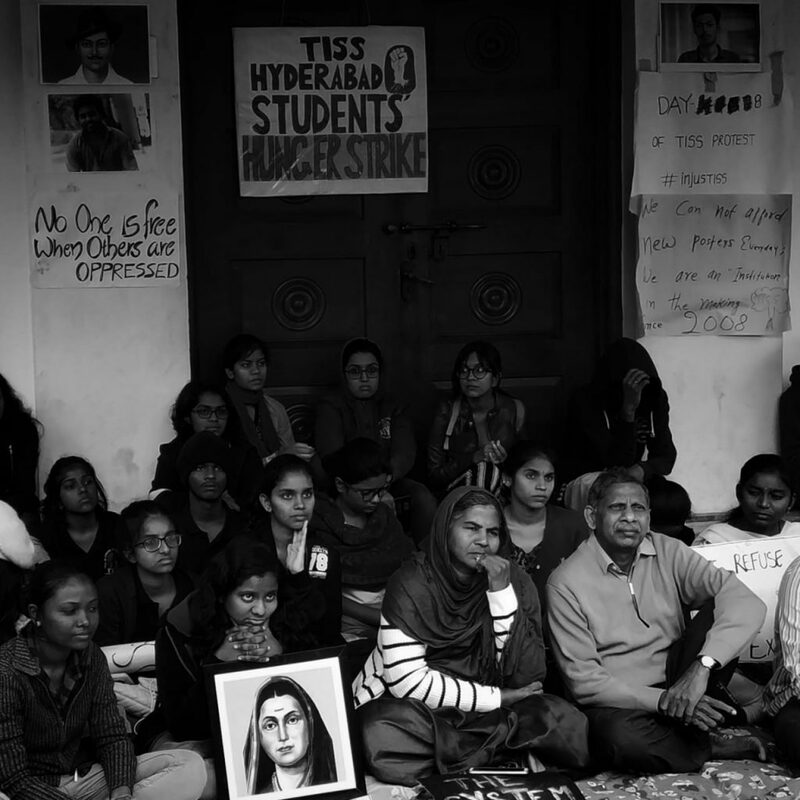 However, it is refreshing to see protest against the institution’s arbitrary decision springing in the campus and the students set out for an hunger strike that was joined by none other than Radhika Vemula. Joel Thomas Mathews is a student of 1st MA Women’s Studies at Tata Institute of Social Sciences, Hyderabad. Also worked as a content editor with ETV Bharat. I have a partial solution. Send your Hindutva people to the USA for a visit. Now if the Hindutva use violent speech or try to attach anyone, they WILL be put in state or federal prisons, as well as fined, … Oh, they will go to a court of law and we USA people WILL straighten them out before they are shipped back humbled to India.